Alienation and obsession are dissected in this unsettling, spare novel. Nishikawa, a listless college student, happens upon a dead man during a nighttime walk. He inexplicably picks up the pistol lying by the body and brings it to his apartment. From this precipitous moment, the weapon becomes an obsession. He finds his tedious reality taking on new meaning through the possibilities of an object which was designed to kill, and yet must conceal his fetish from his classmates, lovers, and - most seriously - the police, who suspect that he has the gun. Nishikawa is acutely aware that he is moving closer to using the gun for its intended purpose. 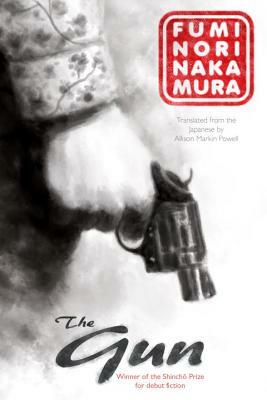 This award-winning noir novel, translated from Japanese, is an unflinching and dark story of one man’s expanding consciousness - and threat. A Tokyo college student's discovery and eventual obsession with a stolen handgun awakens something dark inside him. On a nighttime walk along a Tokyo riverbank, a young man named Nishikawa stumbles on a dead body, beside which lies a gun. From the moment Nishikawa decides to take the gun, the world around him blurs. Knowing he possesses the weapon brings an intoxicating sense of purpose to his dull university life. But soon Nishikawa's personal entanglements become unexpectedly complicated: he finds himself romantically involved with two women while his biological father, whom he's never met, lies dying in a hospital. Through it all, he can't stop thinking about the gun--and the four bullets loaded in its chamber. As he spirals into obsession, his focus is consumed by one idea: that possessing the gun is no longer enough--he must fire it. Fuminori Nakamura was born in 1977 and graduated from Fukushima University in 2000. He has won numerous prizes for his writing, including the Ōe Prize, Japan's largest literary award; the David L. Goodis Award; and the prestigious Akutagawa Prize. The Thief, his first novel to be translated into English, was a finalist for the Los Angeles Times Book Prize. His other novels include The Kingdom, Evil and the Mask, The Boy in the EarthLast Winter, We Parted.